Gerard Gabriel "Gerry" McGovern is an English Design Director for Land Rover, leading the company's Design Studio at Gaydon, Warwickshire, creating concepts and new models. 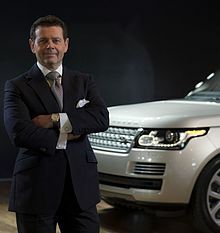 A strong advocate of design's relevance to brand equity, he is a member of the Land Rover board of Management. McGovern was born in Coventry in 1956 where he attended primary and Binley Park secondary schools. While still at the latter, he was introduced to Chrysler design boss Roy Axe, who was to remain a major influence. Chrysler sponsored McGovern at the Lanchester Polytechnic (now Coventry University) where he completed a degree in industrial design before attending the Royal College of Art in London, specialising in automotive design. While sponsored by Chrysler UK, McGovern started work at the Styling Studio at Whitley, Coventry. In 1978 McGovern began working for Chrysler in Highland Park, near Detroit, before returning to the UK as a Senior Designer for Chrysler/Peugeot; here he worked alongside Peter Horbury (later Head of Design for Volvo in Sweden) and Moray Callum (formerly Head of Design for Mazda, then Director of Ford’s Car design division). In 1982 McGovern rejoined Roy Axe (now Design Director) at Austin Rover Group. Through this period he worked on the MG EX-E concept car, was the lead designer of the critically acclaimed  MG F sports car and the Land Rover Freelander (the best selling compact SUV in Europe for 7 years), and led the team that created the third generation Range Rover. In 1999 Ford Motor Company hired McGovern to head up and rejuvenate Lincoln-Mercury design. He set up a new design studio in California and became only the second design professional to be appointed to the Lincoln Mercury Board. Among his hires was Marek Reichman, who went on to become Aston Martin Design Director. McGovern’s first new introduction was the LRX concept – only the second concept car from the company, the first being Range Stormer. LRX was subsequently confirmed for 2011 production and introduced as the compact two litre Range Rover Evoque, with anticipated CO2 emissions of 130g/km. The Range Rover Evoque is the smallest, lightest and most efficient Range Rover ever. Gerry McGovern has also guided the evolution of the 2010 Range Rover, Range Rover Sport and Discovery 4, the latter going on sale globally in September 2009. In 2008 McGovern was elected to the Land Rover Board. This page was last edited on 4 February 2019, at 08:51 (UTC).